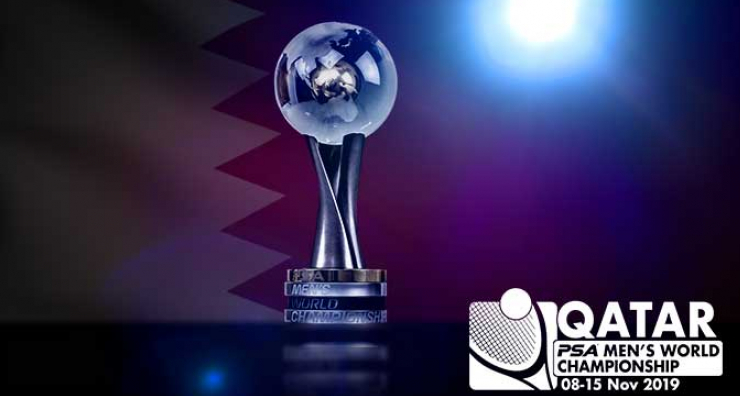 The Professional Squash Association (PSA) announced today that the 2019/20 PSA Men’s World Championships will take place in Doha, Qatar between October 31 – November 8, 2019. The PSA World Championships is the most prestigious and lucrative tournament on the PSA Tour calendar, and the 40th edition of the iconic event will be staged at the Khalifa International Tennis & Squash Complex, where a prize purse of $325,000 will be up for grabs as 64 of the best male players in the world compete for the honour of becoming World Champion. Qatar will stage the sport’s pinnacle tournament for a fifth time after previously hosting the event in 1998, 2004, 2012 and 2014, with the 2014 final between Egyptian duo Ramy Ashour and Mohamed ElShorbagy going down in history as one of the sport’s greatest ever matches. “We are delighted to announce that the 2019/20 PSA Men’s World Championships will take place in Qatar next season and are looking forward to seeing the world’s greatest players return to the country for what promises to be an exciting week of action,” said PSA Chief Executive Alex Gough. “Qatar is a major destination on the international squash scene and has hosted some incredible tournaments and matches down the years. There is also a promising crop of young Qatari players starting to make their mark on the PSA Tour, including Abdullah Mohd Al Tamimi, who is on the verge of making the world’s top 20. Tournament Director Tariq Zainal said: “Hosting the PSA Men’s World Championships is further proof of Qatar’s commitment to the development of sport. Over the years, Qatar has grown to be a global destination for top sporting events, of which squash occupies a major place in the top hierarchy. We are happy and prepared to once again host a memorable event that promises to be the best ever. The 2019/20 PSA Men’s World Championships will replace the Qatar Classic, PSA World Tour Platinum event on the PSA Tour calendar next season. The Qatar Classic will return to the calendar for the 2020/21 campaign.